Will this debate ever end ?- there is hope after reading this study. The results were not so new – other studies have shown similar results. 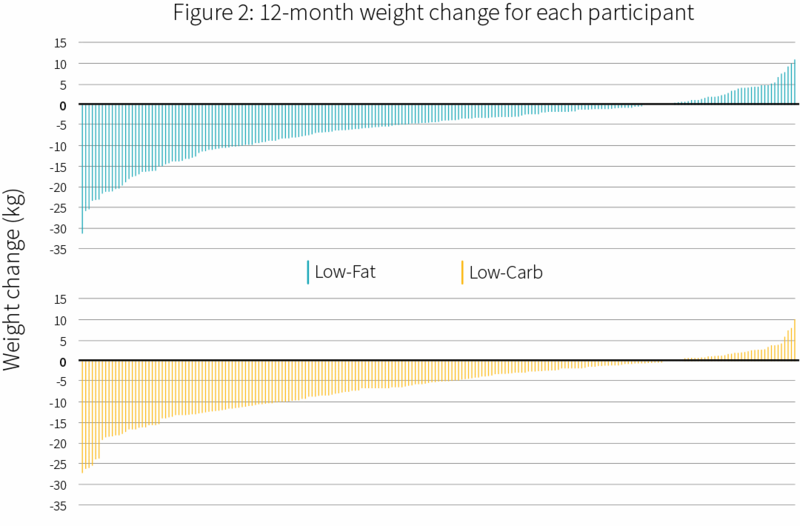 This study showed that it made little difference whether a dieter chooses a low fat or low carbohydrate diet, but it was the quality of the foods in both groups that resulted in a meaningful weight loss instead of dwelling on calorie restriction. The low carbohydrate group had a larger loss, but the differences were not significant. The weight loss range was substantial -some losing a lot of weight while a few even gained weight on both of the diets. The distribution curve was startlingly similar between the groups. This study scored a win for whole foods rather than consuming highly processed foods. Refined carbohydrates are still defined as “junk” so sugar and flour more than likely are not very good food choices for health and/or weight control. “Before worrying about the details, one should ensure their diet is more whole foods (with ample vegetables) than processed foods. If your chosen diet leaves you feeling hungry, you will likely revert back to old eating habits.” was a quote from the lead author of the study. All weight loss programs/plans should include a weight loss maintenance phase since it makes no sense to lose weight and not be able to keep the weight off permanently. If you plan to lose some weight, this study should be a “must read.” You can find the whole study HERE. Categories: General, Healthy Foods, Nutrition Education, Nutrition Research, Obesity and Weight Loss | Tags: Dieting, diets, low carbohydrate, low fat | Permalink. The low carbohydrate and low fat diets both have a long history. Click HERE.